Jester Mardi Gras Daiquiris. - Home of the World's Strongest Drink "The Jester". Recognizing the value of New Orleans as a destination base for a younger demographic, we developed a frozen drink concept, Jester Mardi Gras Daiquiris, which would appeal to a younger, eager to party, Bourbon Street customer base (age 21-34). They introduced the daiquiris at their original French Quarter location, along with a fresh baked pizza-by-the-slice concept. Both took off immediately, and today, Rizzuto has 3 Bourbon Street locations. Jester Beverages is our online marketplace for premium quality drink mixes that contain real fruit juices and purees. They have a 1 year shelf life and never have to be refrigerated. 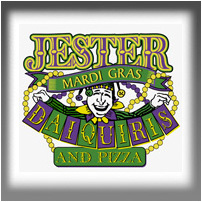 Locally owned Jester Daiquiris are currently sold throughout the French Quarter and other locations throughout the United States.